Male: Brown upperparts, grey head and crimson forehead and breast in summer. Female: Duller than the male and without any crimson. 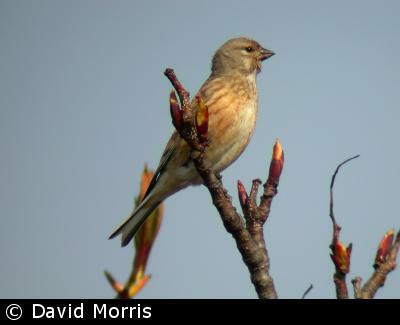 Linnets may be confused with Redpoll and Twite (Cardeulis flavirostris), but both these species are smaller. 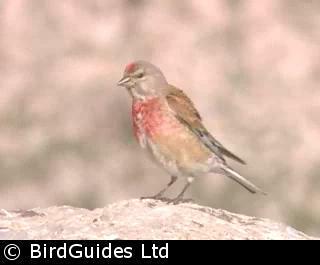 Also, the Redpoll has a red crown and black bib, and the Twite has a pink rump and streaky upperparts. 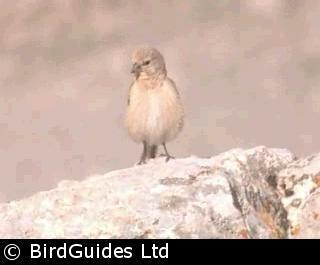 Like all finches the Linnet has a deeply forked tail, although it is quite short in this small finch. Both sexes have a chestnut mantle and whitish underparts with brown streaks, but the female is duller than the male. The bill is grey and the legs are flesh-brown. In the summer, the male is very distinctive with grey head, pale crimson forehead and breast, and dark streaking on its whitish throat. In the winter, they become much duller. Juveniles are similar to the female adult birds, but paler and with bolder streaking, and the bill and legs are pale grey with a yellow or pink tinge. They have a rapid twittering flight call, which is similar to that of the Greenfinch and Redpoll; the Greenfinch's call is lower-pitched and the Redpoll is more metallic sounding. The male's song is a medley of slightly wheezy warbling notes, usually sung from a perch in a tree. Another finch, the Twite, has a "twayee" call with similar qualities to the Linnet but is often described as being more "twangy". In winter, they often form large flocks, sometimes mixed flocks with other seed-eaters, and feed in open country on stubbles, salt-marshes and wasteland. 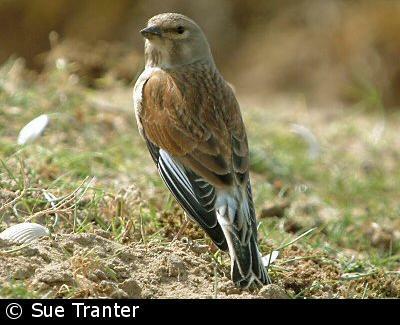 Linnets breed on heaths and scrubland, in hedgerows and in gardens with bushes. The nest, which is built by the female, is a cup of grass, moss and twigs, lined with hair and wool. The smooth, non-glossy eggs are pale blue with fine purple and brown spots, and about 18 mm by 13 mm. Incubation is by the female only. The young are fed by both parents. The resident population is boosted by passage migrants and winter visitors. They have become a species of high conservation concern - a Red Listed species - owing to a dramatic decline since the 1970s. The most likely cause is changes in farming practices, such as smaller field margins and using herbicides to kill the weeds, which means there are fewer weed seeds, and autumn sowing of crops, which means there is less stubble in winter. Set-aside (uncultivated land in which various wildlife habitats may develop over a number of years), wide field margins and traditional hedgerow management can help to halt and reverse their decline.